The National Tile Contractors Association (of America) awarded the ‘River of Life Mosaic’ Best Mosaic Installation at it’s annual award ceremony in Las Vegas 2011. 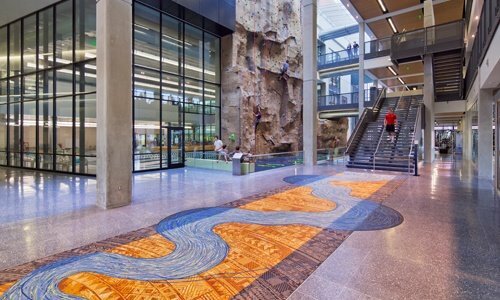 The mosaic was commissioned for the University of Iowa’s new sports centre in Iowa City. 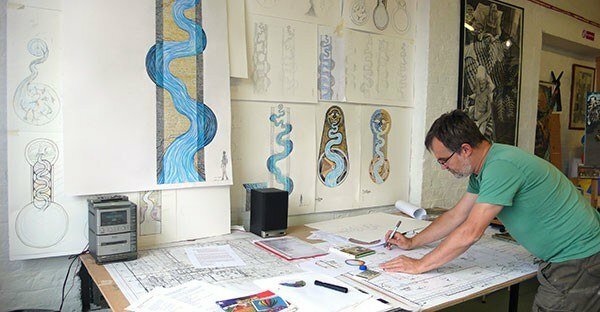 In this article I look at the process of designing the Iowa River of Life Mosaic. 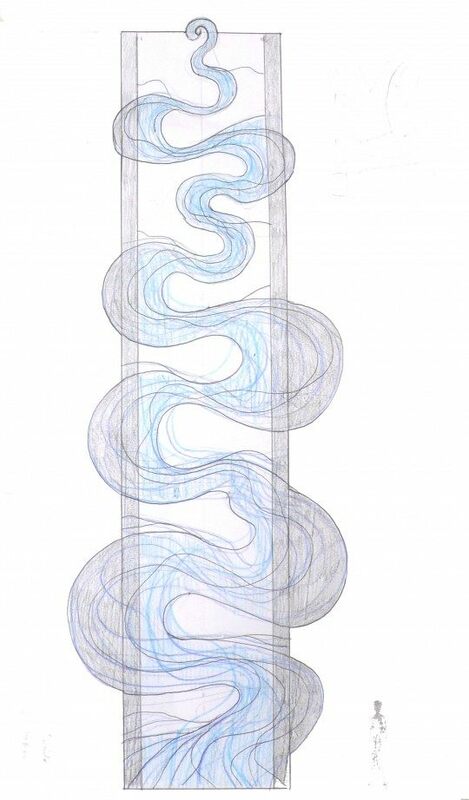 Designing the Iowa River of life Mosaic: One of the things that made a big impression on me during my first trip to Iowa City was the relationship with the river. In particular the devastation of recent flooding. In thinking about the concept of Wellbeing I was captivated by the idea of the river and the vision of wellbeing as a path through our lives, rather than just a state of being at a single moment in time. This came together in the vision of The River of Life. The idea also connected well with the aquatic focus of the CRWC centre. 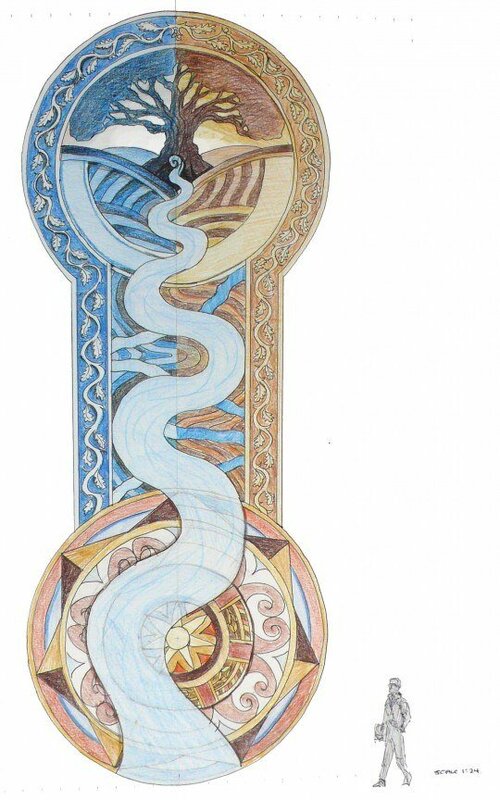 Designing the Iowa River of Life Mosaic was quite a journey. 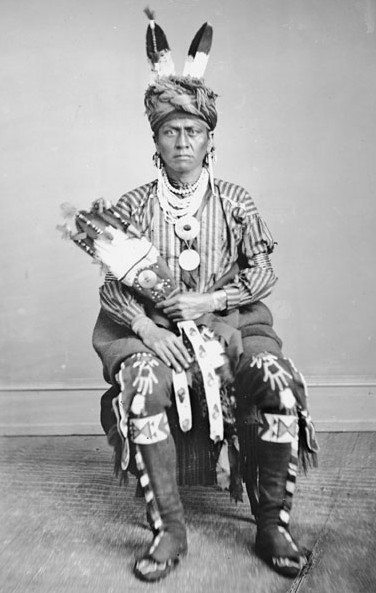 The River symbolising life is an ancient image connecting our most ancient cultures. 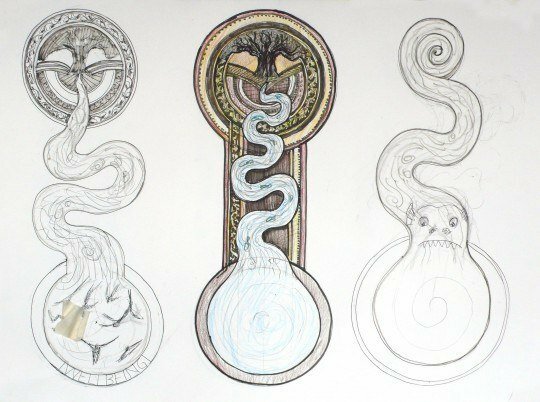 The source of the river symbolising birth and the start of life’s journey, the path to enlightenment. The river is the bringer of life and purification. RDGUSA architects designed the new state of the art building to house the University of Iowa‘s new Campus Recreation and Wellbeing Centre. The 215,000 square foot building stacks the various sports and recreation activities and features a large open foyer area with vertical openings through the building, giving great space and views through. I identified this as the optimum site for the work with it’s great open aspect and opportunities to view the work from several floors above. The building itself was little more than a hole in the ground on my first visit so my research concentrated on the geography and history of the area. I’ve always felt that mosaics have a strong connection with textiles. 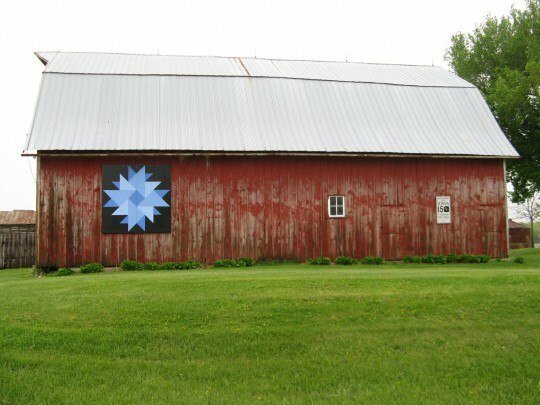 Looking at the textiles of the Indigenous Iowa people, the distinctive Amish quilt works of the area and the local basket weaving tradition began to coalesce with the geography of patchwork fields and the meandering river of Iowa. With so much inspiration and information as a starting point I found myself almost overwhelmed. My initial design roughs became more and more over blown until eventually I reached a halt with a design that was just too much. I knew I had to somehow distill what I had into a more appropriate design for this new building. I looked through my piles of research material again and then saw a NASA photograph of the Iowa River taken from a satellite. 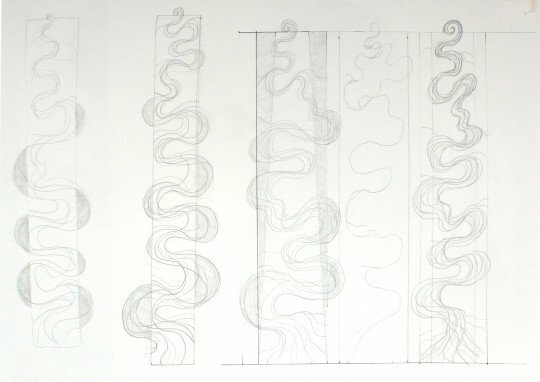 Beginning with the simple meandering line of the river, this photograph helped me distill the design down to the final version. 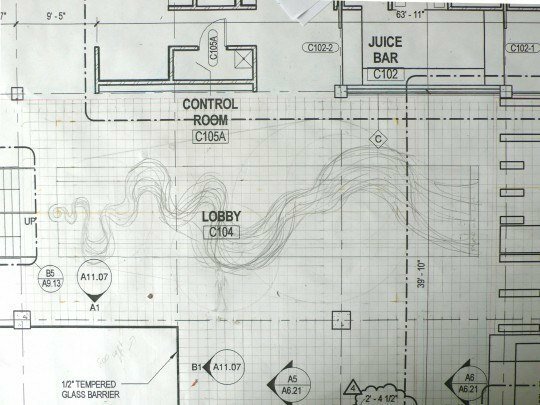 The meandering River bursting it’s banks – the design is distilled further. 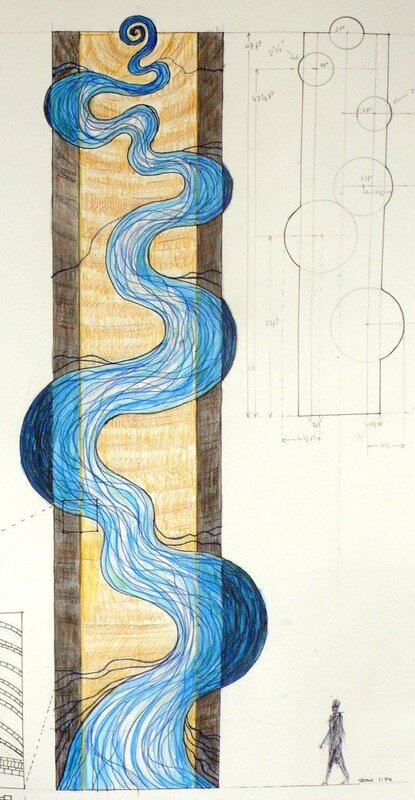 Designing the Iowa River of life Mosaic: The final ‘River of Life’ design for me is very symbolic. It begins with birth, at the top of the mosaic as you enter the space, A spiral emerging. I see the river itself as comprised of life lines. The construction of the mosaic river as interweaving lines of tesserae each represent a life. These life lines all emerge from the birth spiral and trace their journey through life. The background to the river is formed by concentric circles of patterns made up from the local textile patterns, reflecting the patchwork field geography of the area but representing the structures of our cultures and society. The central band of patterns are created in a palette of golden colours. To me this band symbolises life in balance, the zone of wellbeing. Many of those life lines of the river manage to stay within the golden zone, however some do not. Outside of the golden zone the patterns change to shades of grey, this represents life out of balance. That part of the river that flows out of balance darkens. Beyond this ‘out of balance’ zone some parts of the river burst out of the rectangular boundary of the mosaic, just as the Iowa River burst it’s banks. For me this area represents times of extreme stress and difficulties in our lives. Most of the ‘life lines’ of tesserae follow the main flow of the river across the fields, as we all do follow the main cultural and social path from birth to death, weaving in and out of balance. some more erratic than others, occasionally flowing into crisis. A few life lines escape the main flow and disappear off the edge, ending before they might reach their natural end. And so the design was complete. I was happy to submit it and even happier to find the positive reception for it from the committee appointed to oversee the artwork commission.